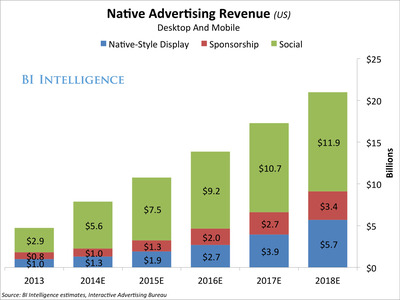 BI IntelligenceThe native ad boom, in one chart. Native is one of the hottest topics in digital media, and advertisers and publishers are taking notice. By creating advertisements that are in the same format as the content audiences are there to consume, marketers hope to provide a much less disruptive advertising experience. Native ads have also proven effective, drawing higher click rates than traditional banner ads, particularly on mobile devices. New and exclusive data from BI Intelligence finds that spending on native ads will reach $US7.9 billion this year and grow to $US21 billion in 2018, rising from just $US4.7 billion in 2013. We are the only research service that has provided a detailed breakdown of spend projections and growth rates for each of the three main native ad types — social-native, native-style display ads, and sponsored content. Social native ads will account for the biggest share of native ad revenue during this time period, but native-style display ads will grow the fastest. Social-native, including Facebook News Feed ads and promoted tweets on Twitter, will draw a majority of native ad revenue between 2013 and 2018. Native display ads, like the splashy native ads on Yahoo’s news pages and apps, will see the fastest ramp-up. Sponsored content, like some of the paid stories and sections on BuzzFeed and The New York Times (and Business Insider), has also attracted considerable attention. Native ads perform better than traditional display. This is particularly true on mobile. Desktop native click-through rates (CTRs) averaged a respectable 0.15%, while native-mobile ads had CTRs over 1%, according to recent data from Polar Media Group and Celtra, respectively. Consumers hold a generally positive attitude toward native advertising, according to survey data, but advertisers and publishers must ensure that ads are relevant and are purchased by trustworthy brands to avoid the risk of any mainstream backlash. The report is full of charts and data that can easily be downloaded and put to use. For full access receive to all BI Intelligence‘s analysis, reporting, and downloadable charts and presentations on the digital media industry, sign up for a trial.